Following the user manual leak last week, Samsung has formally announced the Galaxy A8 (2018) and A8+ (2018) as part of their midrange lineup for 2018. The new mid-rangers use the same design language as the Galaxy S8 and S8+, as well as pack in a dual front-facing camera, support for Samsung Pay, and is available in black, orchid grey, gold, and blue. Surprisingly, the 2018 version of the A8 and A8+ also supports Samsung VR, making it the first midrange phone from the company to do so. Samsung's official specifications make no mention of either a microSD card or 3.5mm headphone jack, though both of these are mentioned in the user manual. While Samsung is noted for using somewhat peculiar 18.5:9 displays (see note), the pair are apparently the first phones anywhere to have a 1080x2220 resolution. Unfortunately, the larger A8+ does not get a resolution bump to match the increased size, though there is an additional 6GB version. Pricing information is not yet available, though the phones are expected to be available in "early January 2018." BeiDou coverage may be limited. Samsung Electronics today announced the latest additions to the Galaxy A series: the Galaxy A8(2018) and A8+(2018). The Galaxy A8(2018) and A8+(2018) feature a Dual Front Camera, a large Infinity Display and stunning ergonomic design that draws on Samsung’s flagship design heritage and experience. With additional everyday features, the Galaxy A series is more stylish, practical and convenient than ever before. Snap bright, clear selfies with the 16MP F1.7 rear camera and 16MP+8MP F1.9 Dual Front Camera, no matter where you are or what you’re doing. The Dual Front Camera is made up of two separate cameras so you can switch between the two to take the type of selfie you want – from close-ups with the background to portrait shots with a clear and crisp background. And with the advanced Live Focus feature, you can easily adjust the bokeh effect before or after you take the picture to create high-quality images. From day to night, the advanced camera makes sure you capture sharp images, even in low-light conditions. The new devices also allow you to customize your photos with fun options, from adding stickers to your selfie or highlighting a culinary extravaganza with Food Mode. Shaky video footage will be a thing of the past with video digital image stabilisation (VDis) technology, and with an added hyperlapse feature, you can now create time-lapse videos that let you record, tell and share even longer stories. When watching movies or playing games, the latest Galaxy A devices set a new standard for uninterrupted, immersive viewing experiences. The Infinity Display goes beyond the bezel with an immersive 18.5:9 display ratio, so that you can view the whole scene across your screen for the ultimate cinematic experience. The large screen is supported with ergonomic curved glass on the back and front. Its sleek glass and metal frame, smooth curves and comfortable grip make it even easier to watch or interact with content on your phone. 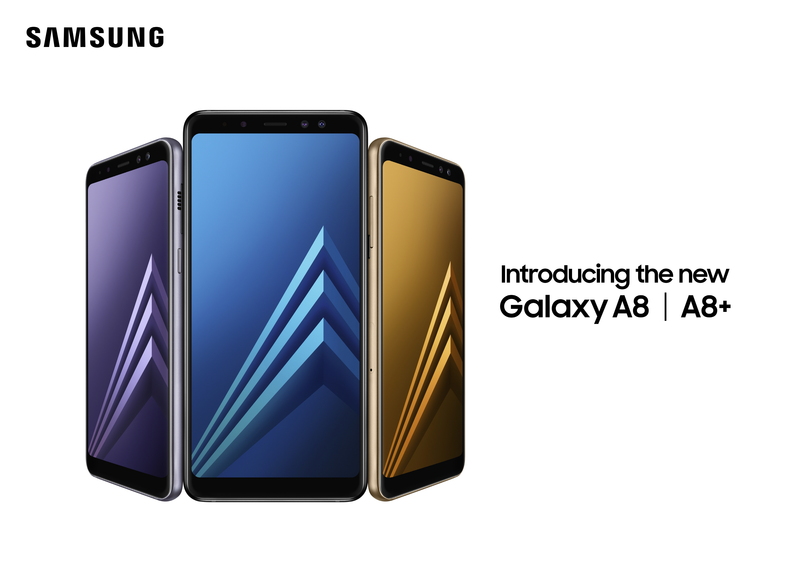 The Galaxy A8(2018) and A8+(2018) are available in four colors including black, orchid grey, gold and blue to suit your personal style. Both devices will continually keep you informed with the Always On Display, meaning you can get information at a glance without unlocking your phone. With Samsung Pay, there’s no need to bring your wallet with you every time you go out. Supporting Magnetic Secure Transmission (MST) and Near Field Communication (NFC), the Galaxy A8(2018) and A8+(2018) can be used virtually anywhere you can tap or swipe your card. Every transaction via Samsung Pay is secure, yet very simple. All it takes is one swipe and one fingerprint scan. Offering IP68 water and dust resistance, the Galaxy A8(2018) and A8+(2018) can withstand the elements, including sweat, rain, sand and dust, making it suitable for nearly any activity or situation. The Galaxy A8(2018) and A8+(2018) support microSD cards so you can expand your storage capacity by as much as 256GB, and are the first in the A series to support Samsung’s Gear VR. The Galaxy A8(2018) and A8+(2018) will be available in early January 2018. Note: Yes, that is what they are called. I am neither the king of math nor the emperor of press releases, so I am powerless to stop this.